Alexandria Ocasio-Cortez declined to join a standing ovation for Donald Trump's State of the Union address. The president used his speech to call for "bipartisanship" and "unity," little of which was on offer from Ocasio-Cortez. Then again, Trump also warned Democrats not to hamper economic growth with "ridiculous partisan investigations," which doesn't sound like the right way to describe probes into potential treason. His address was also peppered with falsehoods. 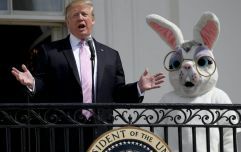 However, the president still said he wanted to work with the new Congress and its House now controlled by the Democrats, drawing applause from most. Including Democrat leader Nancy Pelosi, even if it was a tinged with sarcasm. Trump said: "I stand here ready to work with you to achieve historic breakthroughs for all Americans. Millions of our fellow citizens are watching us now, gathered in this great chamber, hoping that we will govern not as two parties but as one nation. Alexandria Ocasio-Cortez remained seated at the end, as did Eleanor Holmes Norton and Pramila Jayapal. 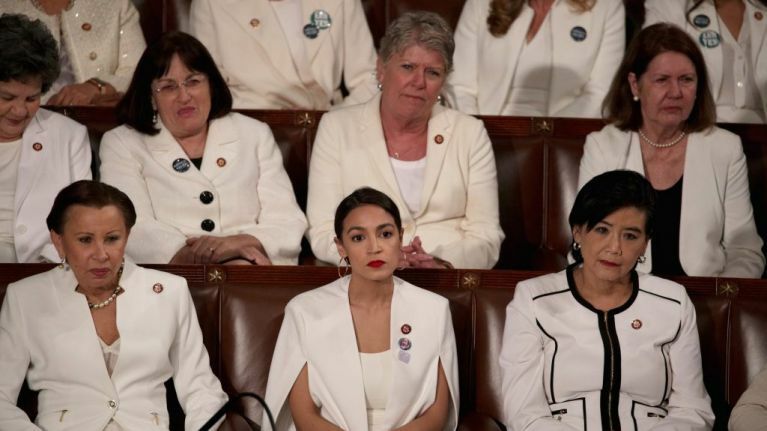 Many women wore white to the address in solidarity. Ocasio-Cortez said: "2019 is the 100th anniversary of the women’s right to vote.... and there’s so much more that we have to fight for. ”From wage equality, to paycheque fairness, to protecting ourselves and believing survivors."